Emily Johns (centre in green scarf) attempting to enter the Department for Transport on 8 April 2013. 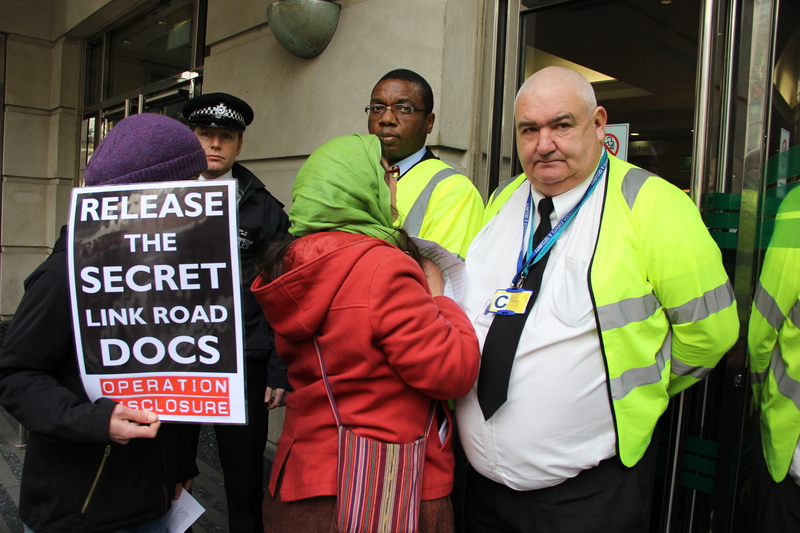 10am, Friday 11 October, Westminster Magistrates Court : An anti-road campaigner arrested during a peaceful attempt to search the Department for Transport (DfT) for its then-secret recommendations about funding for the controversial £113m Bexhill-Hastings Link Road (BHLR) will stand trial in London this Friday. The campaign against the BHLR – the ‘first and the worst’ of over 200 new road-building projects that the Chancellor, Big Business and local councils are currently pushing throughout England and Wales  – has already led to 30 arrests and attracted national media attention . Emily Johns (48), an artist from St Leonards, was arrested on 8 April after trying to enter the DfT to search for the documents . Her actions were part of “Operation Disclosure”, a two-day initiative to search for, copy and distribute the recommendations, which were being withheld from the public . Two months later she was charged with “aggravated trespass”. The recommendations, which were finally released on 29 April, revealed that “possible, alternative road-based solutions ha[d] not been fully worked through and tested” at the time of the decision to fund the project (in March 2012) , and that the DfT had assessed the BHLR as being of “low or medium value for money” – and that it was therefore not a project that the Department would normally consider funding . A recent £13m increase in the cost of the BHLR means it is now a “low value for money” project . incl[uding] three National Parks, the National Wetland of the Norfolk Broads and at least seven Areas of Outstanding Natural Beauty (AONBs).